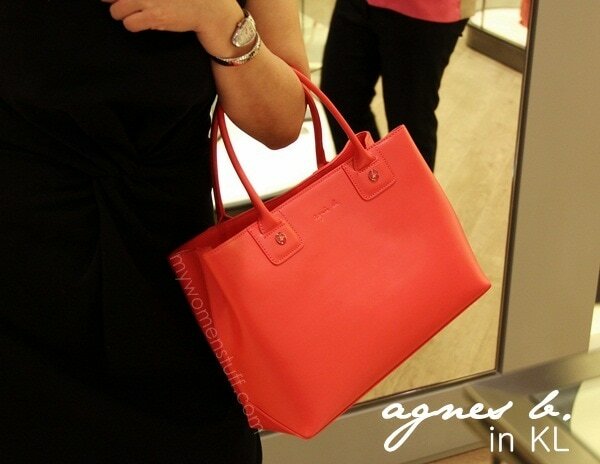 Home » Fashion » Bags » Agnes b. Voyage sails into Kuala Lumpur to offer me more handbag temptation! 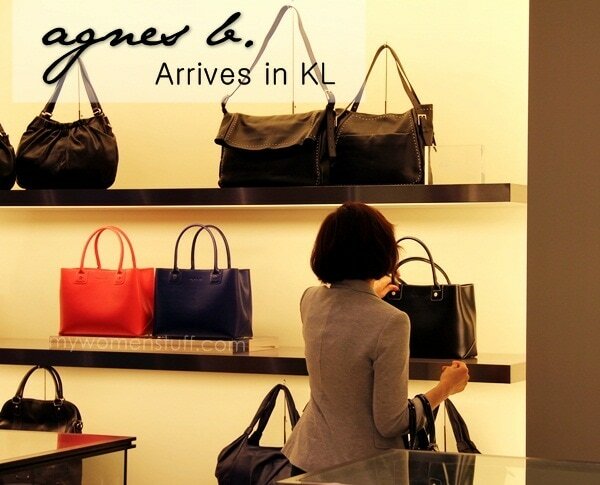 The first agnes b. Voyage store is at Suria KLCC and carries her range of handbags and other accessories. 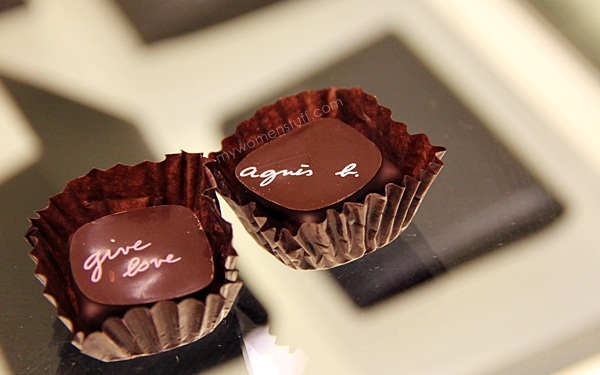 I wouldn’t peg the agnes b. brand as a high end brand but more of an affordable mid priced brand. 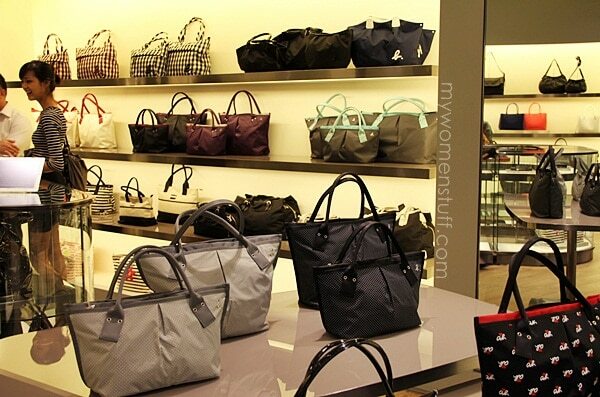 I place it somewhere in between Radley and LeSportsac because they have leather bags as well as nylon canvas bags and prices fall somewhere in between the two. These nylon canvas bags are part of the new Spring/Summer 2012 collection which is carried in store. The material is quite thick and feels very sturdy, with a smooth sheen and feel to it. The totes are very roomy with large compartments and a zip and come in 2 sizes. 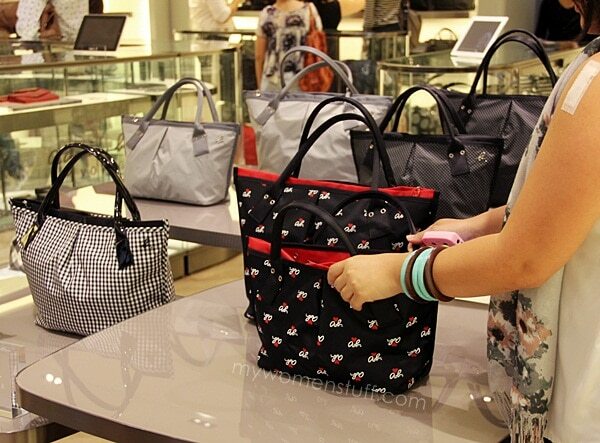 Prices of the new Spring/Summer 2012 totes start from RM600+ and I believe these designs are limited edition. I would however draw your attention to a similarly designed nylon tote which is a part of the regular agnes b. collection. The colours are plainer and the material is a bit more casual in look and feel but I would LOVE to get one to travel with or just for weekends. I believe this is known as the Diane Tote and comes in various combination of colours and 3 sizes, small medium and large. Pictured here is the Medium and Large versions. The small one makes a really cute little handbag for a young girl or if you are the sort who doesn’t carry a lot of stuff. Its not as small as I make it out to be (see picture #2) and actually makes a great weekend bag 😛 The Medium version fits a tablet or a netbook quite comfortably along with the rest of your essentials. I could sling the medium on my shoulder but the small is strictly hand carry. The large could even double up as a weekender or a flight carry on bag. They are very roomy bags and here’s the deal, the prices start from RM390 for the small one and RM470 for the Medium sized one. Yes, I was sorely tempted. 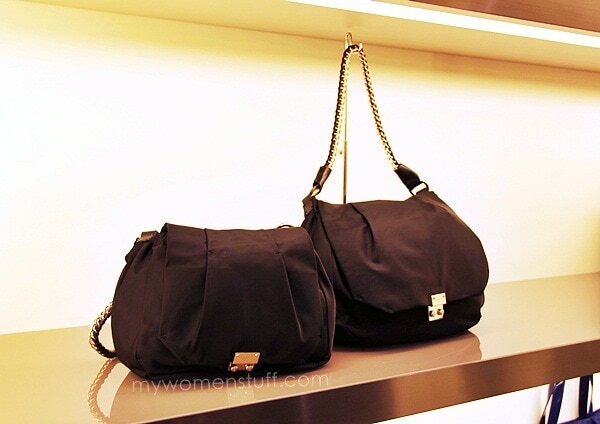 These bags are from the Vanina range – nylon bodies with a chain strap. They don’t look like much sitting on the shelf but I was quite surprised that when carried, they look quite elegant and chic. The interior is quite roomy and it comes in 2 sizes. The smaller version has a long strap that hit at the hip while the larger version is shoulder carry and hits at the waist. They are RM950 each. And here’s another bag my eye was caught by – a structured leather bag that looks so elegant when carried and comes in 2 beautiful bright colours for Spring/Summer – neon coral and electric blue (1st picture above). 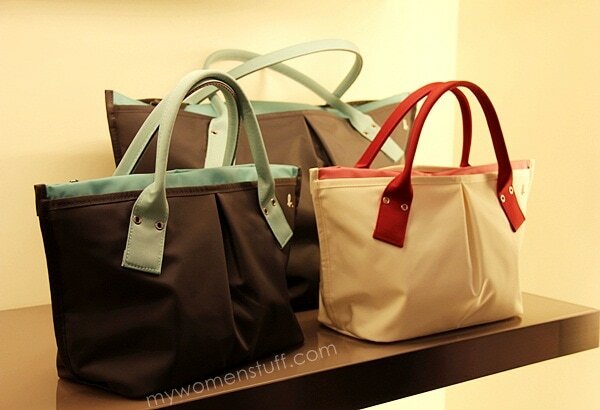 There is also white and black but when you are carrying a bag like this one, I’d say go for the brights. It makes an outfit immediately! I’m told this design is incredibly popular in Hong Kong. NEXT POST: Get a Royal New Look with Dior Royal Kaki 454 Eyeshadow palette : My favourite of the New Look palettes! You may want to take your grievance up with the brand or the store. You may not have realised that this is a blog, and I’m afraid my blog isn’t the correct forum. I have a Agnes b handbag with a minor defect needed repair. Can’t locate the shop anymore at Klcc . Do u know where is the shop now?